This beautiful spring morning, white doves gracefully flew out among pink blossoming trees in downtown Raleigh, as advocates and allies congregated to recognize the price paid by crime victims. 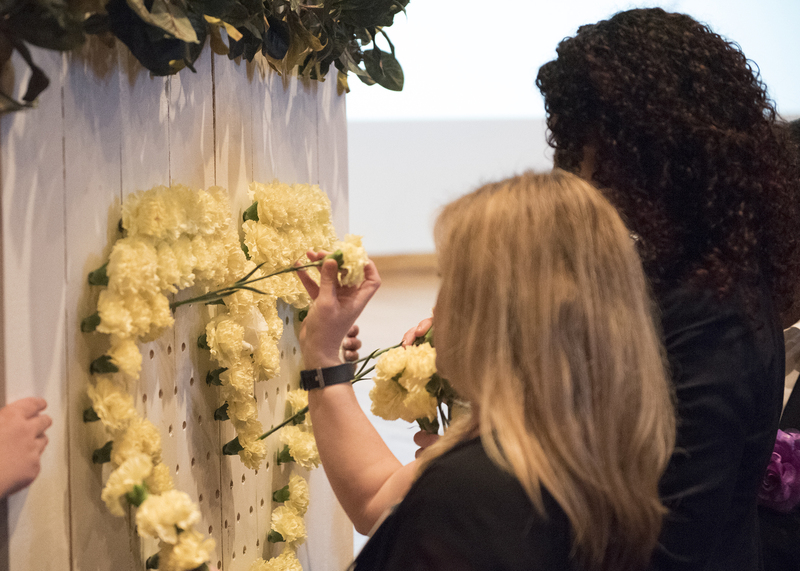 The releasing of doves culminated the second of two events held in honor of Crime Victims’ Rights Week, which Governor Cooper proclaimed to be observed in our state on April 7 through 13, 2019. An April 9 ceremony entitled “Honoring Our Past; Creating Hope for the Future” centered on the opioid crisis, and the victims of the illegal market that feeds the epidemic. The ceremony was hosted through a partnership between the U.S. Attorney’s Office for the Eastern District of North Carolina and the Victim Services Interagency Council of North Carolina (IAC). IAC is a body of victim service providers and allies affiliated with the nonprofit N.C. Victim Assistance Network (NCVAN). “Crime can touch anyone’s life at any time,” reflected U.S. Attorney Robert Higdon during welcoming remarks in the auditorium of the Archives and History/State Library Building in Raleigh. Higdon introduced the concept of the Heroin Education Action Team (HEAT), a name for partnerships between U.S. Attorneys and the families and communities devastated by heroin and opioids. The Eastern District of North Carolina is following a successful model out of Kentucky, and speakers included HEAT members from that state. "We have to come out and speak up, not just for our loved ones who are no longer here, but also for those still struggling,” said HEAT member Laura Parrish, who lost her son to opioids in 2016. She was joined by Jennifer Powell, whose sister died from an opioid overdose in 2015. “We go through many of the same struggles as the addict” to persevere through the loss, Powell said. The event recognized law enforcement individuals for their contributions and included a flower ceremony to commemorate crime victims. Pastor Craig Holladay delivered a touching closing address along with a moment of silence and benediction. Tragically, he had lost his son, a tenth grader, to an opioid overdose only weeks before. He reviewed shocking statistics of the opioid epidemic that now is the leading cause of death for Americans younger than 50, deadlier than gun incidents and automobile deaths combined. “May the day come when we don’t have to have events like this,” he said. This week, Governor Cooper announced that the state will receive $12 million in federal grant funds to continue to battle the opioid epidemic. Wednesday morning, NCVAN hosted its Annual Garden Memorial Service in a blooming outdoor space nestled among state government buildings. Speakers at this memorial included Laura Fu, a homicide survivor. Fu, who now lives in North Carolina, was a student at Hofstra University when her boyfriend was murdered in 2001. She shared her perspective in the “odd pocket of others” whose lives are forever impacted by a crime. Fu was able to eventually channel her feelings into something positive. She launched a telethon fundraiser in honor of her boyfriend, who was a film student, funding a scholarship in his name. Throughout this week, victims and allies were able to come together, hug and share stories, and strengthen their resolve. DPS’ Office of Victim Services plays prominently in the networks that support victims, keeping them informed regarding offender statuses and compensating for some losses associated with crimes. “The Office of Victim Services shares in the efforts to assist crime victims and has supported the Interagency Council and NCVAN throughout many years since the Crime Victims’ Rights Act was enacted; but especially this week as we recognize crime victims in North Carolina,” said Victim Services Director Liddie Shropshire. This week serves as an opportunity to continue to recognize crime victims, which include family members and all of the “others” who live the rest of their lives dealing with the impacts of a crime. The crimes vary, coming from places of violence or the illegal opioid market, but they all leave behind victims, and in more ways than we may appreciate at first.